Gorgeous embroidery brightens up any Christmas scene! Decorate your home with original needlework designs--colorful stockings, embroidered tree centerpieces, and playful ornaments are sure to please. Wine presented in a hand-stitched bag makes a thoughtful gift, and felt peppermint candies draw the eye with holiday flair. 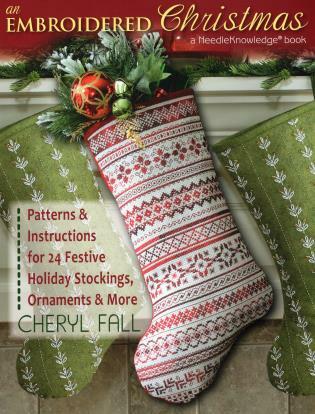 Cheryl Fall has been designing needlecraft patterns professionally since 1986 and is the author of fourteen books, including Embroidery Basics, Simply Samplers, and three titles in the popular Dummies series. She has written more than 2,000 articles on how-to crafts and maintains her own Needleknowledge.com website. Fall was also the host of the nationally distributed PBS Plus series The Creative Life. She lives near Portland, Oregon.